As the world hurtles towards a bloodless digital future of flickering electronic screens and virtual experiences, certain places of primal architectural power become ever more valuable as anchors of the past. 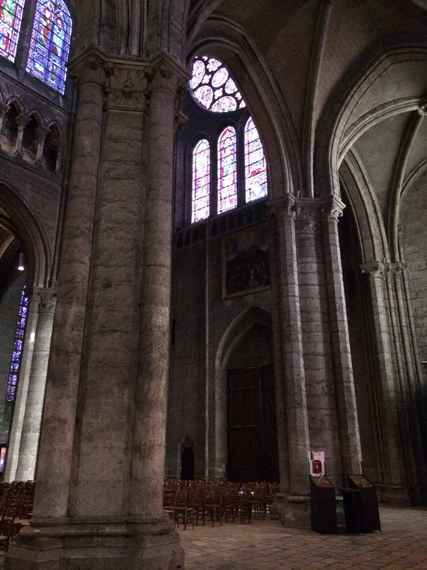 Chartres Cathedral is one of the most important of these sacred places, however its interior is in mortal danger of dissolving into a pale, kitsch version of its former sublime self. In the name of a "restoration" to what is claimed to be the original 13th century interior, the gray stones are literally being painted in white lime wash and beige paint with faux stone joint lines; erasing all traces of the past. This is cultural vandalism of the lowest order, on par with the Taliban's demolition of the Bamiyan Buddhas in Afghanistan in 2001. Last month after an absence of 25 years, I was looking forward to a return to Chartres, fully expecting the magnificent, dark, cavernous interior, illuminated by the jewel like glow of the original stained glass. The effect, like the "lumiere mysterieuse" of the interiors of Sir John Soane, was to recall the light of the celestial Jerusalem, described in The Book of Revelation, the colors corresponding to the twelve foundation stones of the Holy City that had descended from heaven. Chartres was all of one piece, as if carved from a single rock. 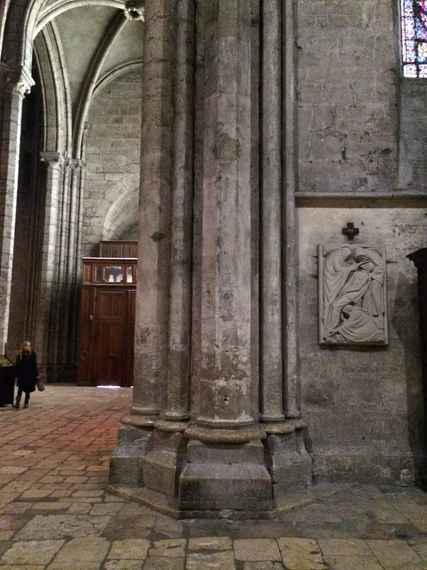 The floors are ancient stone, out of which grow the massive columns from which the ceiling flowed upwards into interlocking curving vaults. Shockingly now, instead of the patina of age that marked and mottled the thick columns and walls, the newly applied white and beige paint looks like a rundown apartment that has been painted for an upcoming real estate sale. The great lie of this project is revealed when one looks at the juncture between the gently undulating stone floor, uneven from centuries of wear by pilgrims, and the freshly painted columns. Any first year interior design student would see the jarring juxtaposition of the white columns that rise just above the exisiting column bases as a terrible mistake that makes both look quite horrible. The white paint makes the floor and base look filthy and dirty, while the antique floor makes the white painted columns look even more out of place, a total aesthetic disaster. Perhaps at this point they should go all the way and remove the floor and install newly cut limestone paving. Then it would again be all of a piece. After all, one pays top dollar for ancient stone floors cut from old French houses at high end decorator shops in New York or London. Imagine what the original stone floors of Chartres Cathedral would fetch! This "restoration" goes against every single cultural trend today that values the patina of age and the mark of time rather than the shiny bling of cheap jewelry and faux finishes that often characterize a nouveau Russian interior. The power of materiality is a sign of authenticity in architecture for at least the past 75 years. From Louis Kahn's use of materials that reflect the work of the craftsman, whether naked stone, brick or steel, to Le Corbusier's raw beton brut concrete and the impasto of the stucco on the chapel at Ronchamp, it is a poignant reminder of the impossibility of halting the effects of time. More examples include George Nakashima's natural wood slab tables, Isamu Noguchi's rough hewn sculpture, and in popular culture, the sensibility is reflected in the evocative faded photographs of the magazine "World of Interiors", honed versus polished marble, artisanal cheese, and even misshapen heirloom tomatoes. Value is placed on exactly what Marcel Proust in his "Remembrance of Things Past" described as objects to evoke memory. How ironic that the interior of Chartres itself, the queen of memory and time, should be white washed and its past erased by the very French culture from which Proust emerged. At Chartres the effect is not unlike the reflective surfaces of a Jeff Koon's stainless steel balloon dog; a bauble of surface without memory. In a triumph of global youth culture, the marks of age are disdained; a facelift for Chartres and the Virgin Mary covers the blotches and smooths out the wrinkles. Old age is so outré, who knew Chartres could be chic, now camera ready for fashion runway shows down the central aisle. The color scheme of white and gold beige is remarkably similar to Ian Schrager's new Edition Hotel in Miami Beach, so au courant. "The sin of restoration - Neither by the public, nor by those who have the care of public monuments, is the true meaning of the word restoration understood. It means the most total destruction which a building can suffer: a destruction out of which no remnants can be gathered: a destruction accompanied with false description of the thing destroyed. Do not let us deceive ourselves in this important matter; it is impossible, as impossible as to raise the dead, to restore anything that has ever been great or beautiful in architecture. That which I have insisted upon as the life of the whole, that spirit which is given only by the hand and the eye of the workman, can never be recalled." The idea that the 13th century interior of Chartres can be recreated is so totally absurd as to be laughable if it were not happening right now. As Martin Filler has observed, there are bright electric up lights at the top of the columns shining on the vaults above (http://www.nybooks.com/blogs/nyrblog/2014/dec/14/scandalous-makeover-chartres/). These are not the candles, nor the daylight that filtered through the colored stained glass, changing as the clouds passed in front of the sun, nor day turning to night, but a crude 21st century lighting scheme. What is being perpetrated is the revenge of the spirit of Le Corbusier in his book "Quand les Cathedrales Etaient Blanches" ("When the Cathedrals Were White") of 1947. A polemic that was meant entirely as a metaphor, that the rise of modern architecture in the contemporary world as a promise of a better life for all, was like the medieval era in France when all society worked together towards a single goal, is unbelievably taken literally at Chartres. Le Corbusier, with a touch of racism wrote "An international language reigned wherever the white race was, favoring the exchange of ideas and the transfer of culture." ... The cathedrals were white because they were new." Well clearly Chartres Cathedral is no longer new, it is 800 years old! For the "restorers" who wish to return to the 13th century, shall we bring back the Inquisition, burn heretics at the stake, persecute the Cathars and expel the Jews of France? Along the same thinking, should the ancient relic of Chartres, the sacred Tunic of the Virgin Mary, which is looking quite tattered, be rewoven into something more spiffy by Knoll or Scalamandre? What is required here at Chartres is a step back and a careful reassement of the entire project in the manner of David Chipperfield and Julian Harrap's renovation of the Neues Museum in Berlin. Here they have, as Suzanne Stephens writes "conserved, rehabilitated, reconstructed and remodeled" in an enormously sensitive way, leaving the past while reimagining a new life for a building that had been in ruins for 70 years. The present work at Chartres is arrogant and brutal, not done with the humility and sensitivity that this greatest of sacred spaces demands. It is a great dishonor to the cultural patrimony of France. Perhaps at this point only a miracle of Divine intervention can save Chartres. I would appeal directly to Pope Frances who hopefully would weigh in on the side of retaining the original sublime sense of the interior before its too late.